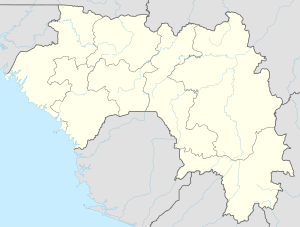 Dubréka is a town in Guinea, lying immediately north of Conakry. Population 8,300 (2008 est). As the birthplace of president Lansana Conté, it has a good infrastructure and is also known for its mangrove swamps. It has a station on a 1000mm gauge railway that carries bauxite from Fria. This Guinea location article is a stub. You can help Wikipedia by expanding it. This page was last edited on 22 July 2018, at 05:03 (UTC).